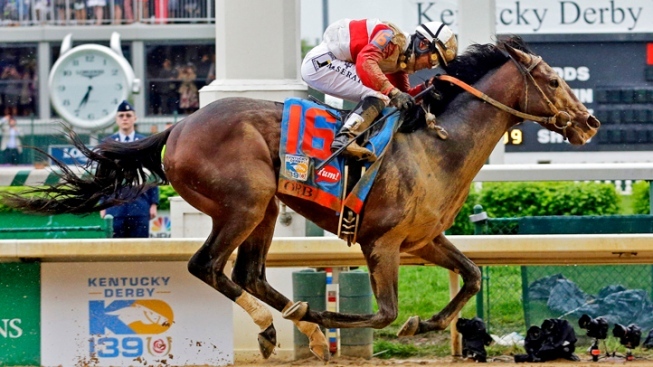 Joel Rosario rides Orb to the win at the 139th Kentucky Derby at Churchill Downs Saturday, May 4. Orb is becoming quite comfortable in the rain. The Kentucky Derby winner returned to the track for the first time since splashing his way to victory at Churchill Downs, taking a one-mile jog over a muddy surface at Belmont Park on Wednesday. With exercise rider Jennifer Patterson aboard, Orb wasn't bothered in the least by the rain, and trainer Shug McGaughey said he was pleased with what he saw. He said "it seems to me all systems are go." Orb will gallop Thursday, and likely have a workout Monday before being vanned to Baltimore on Tuesday for the Preakness on May 18. In other Preakness news, trainer D. Wayne Lukas has added a third horse to his lineup with Titletown Five, a 3-year-old owned by NFL Hall of Famer Paul Hornung. Lukas also picked his riders for his three Preakness horses — Mike Smith on Will Take Charge, Gary Stevens remains on Oxbow and Julien Leparoux has the call on Titletown Five. Also, John Velazquez replaces Elvis Trujillo aboard Itsmyluckyday, who finished 15th in the Derby.